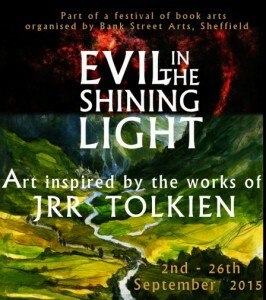 A dynamic and conceptual exhibition of Art inspired by the writing of JRR Tolkien opens in the Northern UK City of Sheffield for the duration of September. 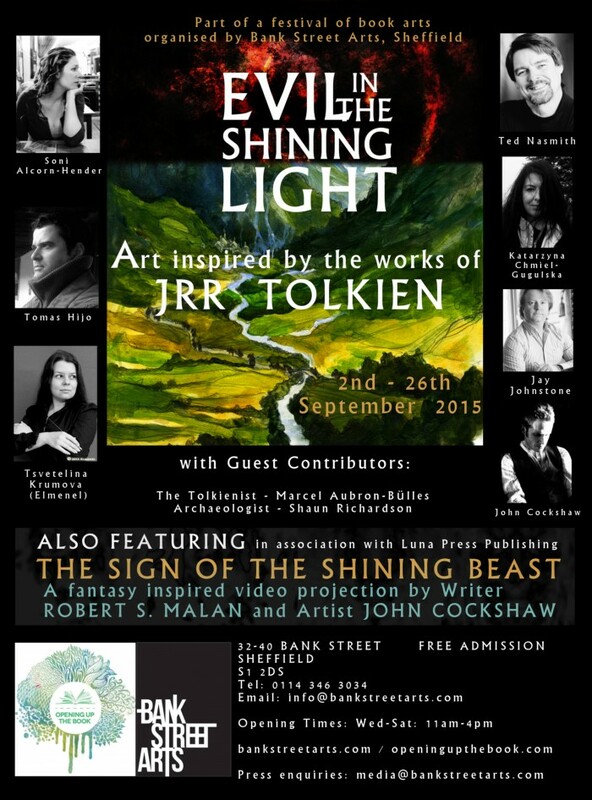 Under the organisation of Artist John Cockshaw, and as part of a festival of book arts known as “Opening up the Book”, a collection of ten distinctive artists and writers will contribute a unique approach to celebrating Tolkien’s beloved Middle-earth. The exhibition title “Evil in the Shining Light” will be connected to in a range of different and highly creative ways. The Artists on show are Soni Alcorn-Hender, Tomas Hijo, Jay Johnstone, Katarzyna Chmiel-Gugulska, Ted Nasmith, Tsvetelina Krumova – Elmenel and John Cockshaw and will be further accompanied by contributions from The Tolkienist Marcel Aubron-Bulles and something unexpected from a local Archaeologist. There are links to be made to the films too and most specifically with reference made to Author and Musician Doug Adams’ landmark 2010 book ‘The Music of The Lord of the Rings Films: A Comprehensive Account of Howard Shore’s Scores’ (Carpentier/Alfred Music Publishing). Specially adapted from an article that featured in Film Score Monthly to coincide with ‘The Battle of the Five Armies’ Artist John Cockshaw presents a series of works that take equal inspiration from Shore’s film scores and Adams’ fascinating analysis of them. This aspect of the show will present a creative bridging between the movies the the books; Shore’s complete score can be said to be a magnificent interpretation of Tolkien’s writing in its own right and for a complex film score to be deserving of a scholarly book says much about its power and resonance. This material is on show and abridged with the kind permission of Film Score Monthly with reference to Doug Adams’ work referenced with the kind permission of the author. Further developing the conceptual nature of the exhibition is the screening of an original video project by John Cockshaw and Writer Robert S. Malan titled ‘The Sign of the Shining Beast’. In association with Luna Press Publishing, this element of the show uses a shared interest in Tolkien as a springboard to explore wider aspects of fantasy and SF with allusions to the graphic novel book format. The ‘Sign of the Shining Beast’ includes much imagery inspired by Tolkien’s Middle-earth and plays as a series of unsettling recurring visions in the manner of what one might see within a Palantir or the Mirror of Galadriel for example. “Evil in the Shining Light” opens at Bank Street Arts, Sheffield from 2nd to 26th September with free admission and an exciting opportunity to meet a selection of contributors to the show.